Ahhh the humble potato. It is like the little black dress of the culinary world. What doesn’t go well with the delectable potato? You can dress it up like a French Gratin. Even better you can make it casual and comfortable like smashed, with butter and sour cream. I decided to make mine all crispy and crunchy in my cast iron skillet. This is a pretty versatile recipe. You could serve it for a big family breakfast, alongside bacon and eggs. You could serve this for a Lenten lunch with a piece of fish and a salad to go with it. Most of all you could serve this for dinner along with a juicy steak for a special treat, perhaps to celebrate a promotion or something. Anyway you make it, there is nothing better than the oh so humble potato. In a small saucepan, melt the butter and bring it to a gentle simmer. When the milk solids start to sink to the bottom, slowly pour the butter into a bowl, keeping as much of the white milky liquid as possible in the saucepan. Discard the milk solids set aside. 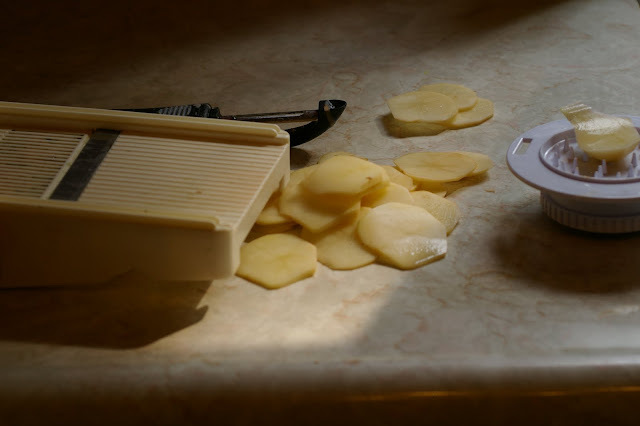 Cut all of the potatoes into thin (1/8-inch thick) slices. I used my trusty mandolin to ensure they are as close to thinness as possible. Transfer them to a bowl and cover them with 3/4 of the melted butter. Season with a little salt, pepper and rosemary. Toss to coat the potatoes with the butter. Pour the remaining butter in the bottom of the cast iron skillet and swirl it around to coat the bottom and sides. Layer the potatoes. Press down gently on the potatoes to make sure they are starting to stick together and form a cake. Place the skillet on the stove top on high heat and cook until the edges start to brown. It will take about 5 to 8 minutes. 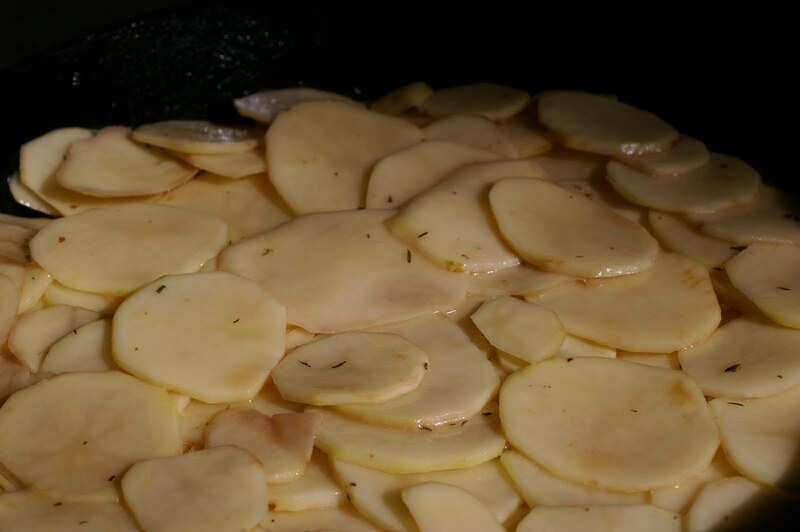 Place the skillet in the oven and cook, until the potatoes feel tender in the center when pierced with a fork. Remove the skillet and carefully pour off any excess butter or liquid that may have formed on the bottom. Place the skillet on a flat surface and cover it with a platter larger than the skillet. Carefully turn the platter over. Lift off the skillet and use a large spatula to place it back in the skillet. Pour the butter back in and cook in the oven for an additional 5 to 8 minutes. Remove from the oven. Pour off any liquid. Garnish with chives and serve. Place the skillet on the stove top on high heat and cook until the edges start to brown. It will take about 5 to 8 minutes. Place the skillet in the oven at 400 degrees and cook, until the potatoes feel tender in the center when pierced with a fork if they start to brown to fast lower the temp to 350. Remove the skillet and carefully pour off any excess butter or liquid that may have formed on the bottom. Place the skillet on a flat surface and cover it with a platter larger than the skillet. Carefully turn the platter over. Lift off the skillet and use a large spatula to place it back in the skillet. Pour the butter back in and cook in the oven for an additional 5 to 8 minutes. Remove from the oven. Pour off any liquid. Garnish with chives and serve. 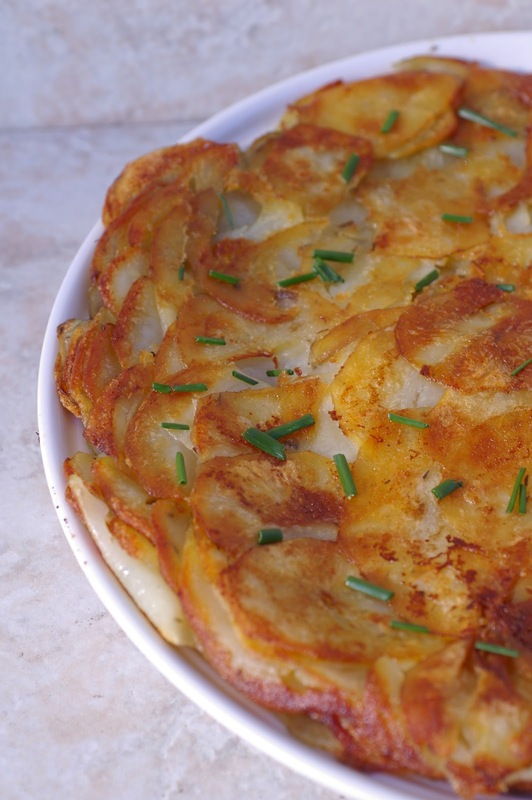 This is a lovely dish you have here Veronica!I absolutely love potatoes and I like the way you have cooked the dish:)Thanks for the recipe! These look so delicious! I am loving your blog! Oh, you did this perfectly! Just beautiful!!! This is beautiful Veronica! I like my hash browns, french fries, etc. to be crispy on the outside and it looks like you have mastered that on this dish, yum! 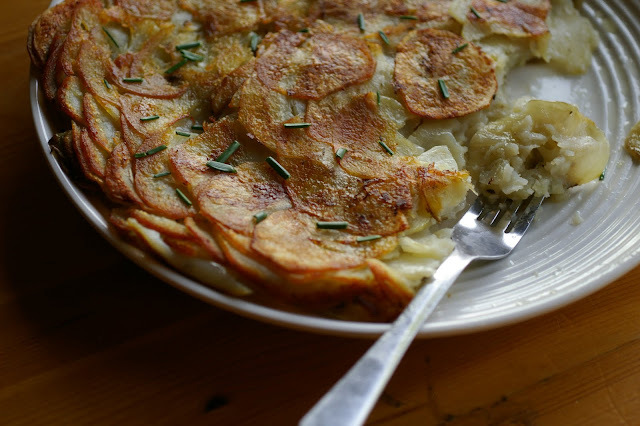 I am pretty potato obsessed, but I’ve never tried this method! Thanks for sharing! Wow this looks amazing! Nice and crisp golden brown on the outside, I bet it was fantastic! 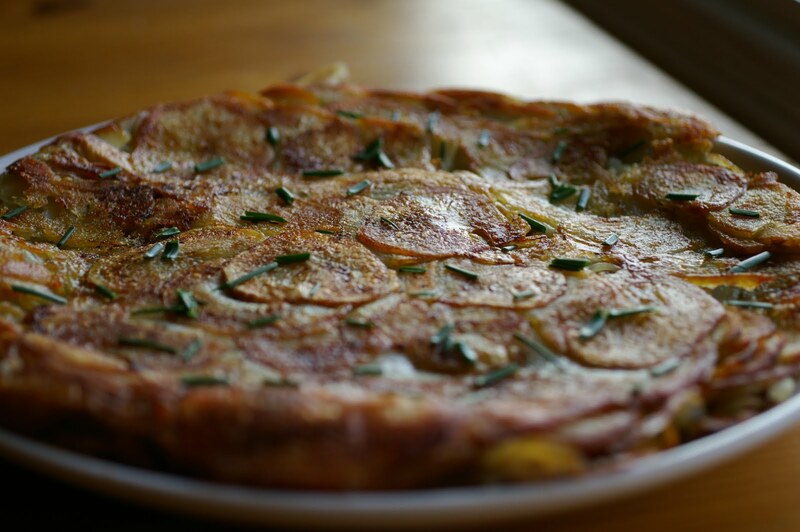 Oh, I have only had a potato cake once before, but I remember it being SO good! Yours looks wonderful! Love the golden brown crispiness on it! This is just so beautiful and simple and good! Veronica, you have grown soooo much as a blogger! I love stopping in to see what you’re doing with your recipes, your writing, and your photography! Keep it up! I am so inspired by you! Blessings! That is so beautiful, I love how you made this recipe. It would be such a delicious addition to any breakfast or brunch. I can’t wait to give this a try! This looks so yummy! I’m always trying to find new ways to use potatoes. I’m pretty sure my family would love this! That looks gorgeous Veronica! I know my sister would love it. She’s a potato fiend! No this is a recipe I want A.S.A.P. to be made in my kitchen1 Oh my laws….this looks perfect! These look super crispy, just the way I like potatoes! Wow, those crispy potatoes look so delicious! Looks beautiful! I love crispy potatoes like this! Yum yum yum!!! Sometimes the simplest foods are the best. I am making this. You think 1am is a decent time to make it? I wouldn’t have to share since everyone else is asleep. Veronica, I just bought two large bags of potatoes, and now i know what to do with at least a few of them. Hi Veronica: I really like your post. This is what we would call a pan haggerty. These are great because you can put any filling in them. Although it isn’t lenten we like ours with bacon and a good wesleyendale cheese, in between the layers. Great with a salad or all by itself for lunch. I have a brand new skillet just waiting for this recipe. I’ll bet I could do the same thing with sweet potatoes too, don’t you think? OH Kristen, I never thought of that. It would be very good with sweet potato. Dont forget to season your new skillet. This was a beautiful recipe…congratulations on making Top 9! I love potato anything! Looks delish. This looks really good. I think I will prepare this in my Baptist kitchen. Happy New Year 2013. Ha Ha very funny. Happy New Year to you also. This looks delicious! What temp do you put your oven on? I want to make this soon, thanks! Thanks for catching that Jessica. I have changed it. I think I cooked it on 400. If it starts to brown to fast then lower the temp to 350. I am making this recipe for the second time and we love it. I am using thyme instead of rosemary because that it what I have in my garden. Thanks for the new addition!